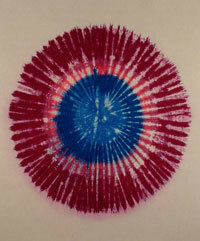 Huge, wall-sized sheets of linen are stained with concentric rings of blazing colour. The technique is immediately recognizable: tie-dye, an ancient Eastern process of textile design appropriated by the American counter-culture of the 1960s and 70s as a by-word for peace, freedom and protest against the Vietnam War, which has long since entered the western world’s fashion mainstream. Its use here as a form of artistic expression is a very deliberate choice on the part of the artist, as too is the scale and palette of the various untitled works. The paintings are as American as Bugs Bunny and pecan pie, open plains on which past meets present to paint a new American landscape; the Manifest Destiny tailored to a modernist sensibility. Stretched and framed, they represent something of an anomaly. Walking the line between high and low art, mass production and hand-made craft, the works knowingly reference several of America’s most iconic visual images. The considerable size of the works is rooted in the Abstract Expressionist heroism of Jackson Pollock, Barrnett Newman, and those that followed them, while their palette abandons the acidic psychedelia traditionally associated with tie-dye imagery in favour of the lyrical hues reminiscent of Colour Field artists such as Morrris Louis, Helen Frankenthaler and Kenneth Noland. Continuing the experiments begun by Turner, Kandsinsky and Albers, this latter group was interested in the atmospheric effects of colour, enveloping the viewer in an impersonal and unashamedly two-dimensional environment on a monumental scale. The dominant motif in each of Phelan’s works, a target, is similarly borrrowed from the Color Field lexicon, specifically the paintings made by Noland between 1958-62. They were not intended to be read as targets per se, unlike those that Jasper Johns was producing at around the same time. Rather, the target functioned as it had several decades earlier in the work of Robert Delaunay: as a purely formal device, devoid of narrative or overtly personal expression and well suited to the artist’s investigations into abstraction. 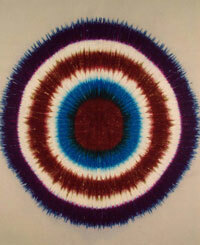 Aligning the colours in dense rings serves to concentrate their effects and intensify their relationships. Some recede quietly while others advance, pulsating with life. The process by which the works are created is of less importance than the choice of their colours, which is made by the artist with the aid of a computerised pantone. When this has been done, the physical act of production is entrusted to a specialized workshop in the artist’s home state of Texas. Chance of course plays its part, dictating the way in which different dyes will react and determining the extent of irregularity in the the staining at the rings’ edges. 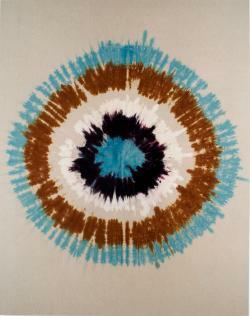 Huge, wall-sized sheets of linen are stained with concentric rings of blazing colour. The technique is immediately recognizable: tie-dye, an ancient Eastern process of textile design appropriated by the American counter-culture of the 1960s and 70s as a by-word for peace, freedom and protest against the Vietnam War, which has long since entered the western world's fashion mainstream. Its use here as a form of artistic expression is a very deliberate choice on the part of the artist, as too is the scale and palette of the various untitled works. The paintings are as American as Bugs Bunny and pecan pie, open plains on which past meets present to paint a new American landscape; the Manifest Destiny tailored to a modernist sensibility. Stretched and framed, they represent something of an anomaly. Walking the line between high and low art, mass production and hand-made craft, the works knowingly reference several of America's most iconic visual images. The considerable size of the works is rooted in the Abstract Expressionist heroism of Jackson Pollock, Barrnett Newman, and those that followed them, while their palette abandons the acidic psychedelia traditionally associated with tie-dye imagery in favour of the lyrical hues reminiscent of Colour Field artists such as Morrris Louis, Helen Frankenthaler and Kenneth Noland. Continuing the experiments begun by Turner, Kandsinsky and Albers, this latter group was interested in the atmospheric effects of colour, enveloping the viewer in an impersonal and unashamedly two-dimensional environment on a monumental scale. The dominant motif in each of Phelan's works, a target, is similarly borrrowed from the Color Field lexicon, specifically the paintings made by Noland between 1958-62. They were not intended to be read as targets per se, unlike those that Jasper Johns was producing at around the same time. Rather, the target functioned as it had several decades earlier in the work of Robert Delaunay: as a purely formal device, devoid of narrative or overtly personal expression and well suited to the artist's investigations into abstraction. Aligning the colours in dense rings serves to concentrate their effects and intensify their relationships. Some recede quietly while others advance, pulsating with life. The process by which the works are created is of less importance than the choice of their colours, which is made by the artist with the aid of a computerised pantone. When this has been done, the physical act of production is entrusted to a specialized workshop in the artist's home state of Texas. Chance of course plays its part, dictating the way in which different dyes will react and determining the extent of irregularity in the the staining at the rings' edges.